I do an exercise in my workshops using a pole. I tell participants to lower the pole to the ground. I give them two rules: The pole can’t lose contact with their index fingers, and they can’t use gravity to pull the pole. This exercise is hard. Everybody’s focused just on their small section of the pole. But, they figure out that to lower the pole, they must focus on everybody, not just their section. This activity helps improve internal customer service. Just like with the pole, a good internal customer experience requires people to focus beyond their own tasks. You have to think broader. When everyone focuses on the bigger picture, the result is an extraordinary external customer experience. Here are three keys that will help improve your internal customer relations, which enables you to deliver a better external customer experience. 1. Seek Out Customer Contact. I spent a week at the offices of one of my clients. As I walked around through the halls, literally everyone I encountered, looked at me, made eye contact and spoke — every single person. Several people during the week struck up conversations with me. I felt so welcome. And the employees didn’t just reach out to me; these friendly interactions were taking place everywhere. It was not lost on me that this was an intentional culture: to seek out contact with both internal and external customers. When you’re walking around, look out at people. Smile, and take a second to speak. Go above and beyond with customers by meeting needs people don’t even express. Chick-Fil-A is a good example of meeting needs customers don’t communicate. During peak times at Chick-Fil-A, you’ll often see an employee standing in the drive-thru area to take orders and payments so that when you get to the window, you’re in and out quickly. People go to Chick-Fil-A for the food – that’s the expressed need. But the company has found a need that isn’t expressed: Customer’s need to get in and out quickly. They meet that need by having employees stationed outside during the busiest times. Always be thinking, “What might my customer need – that they haven’t specifically asked for?” Do this with both internal and external customers, and you’ll be seen as responsive and indispensable. A lot of frustration in companies happens when people don’t follow-up. Customers, both internal and external, seem always to be waiting for an update. Reduce frustration by keeping people updated. Apply these keys to interactions with both internal and external customers, and you’ll be positioned to deliver the best possible all-around experience to your customers. Now you can give your employees even more great skills for delivering the best customer experience and for handling difficult customer situations. 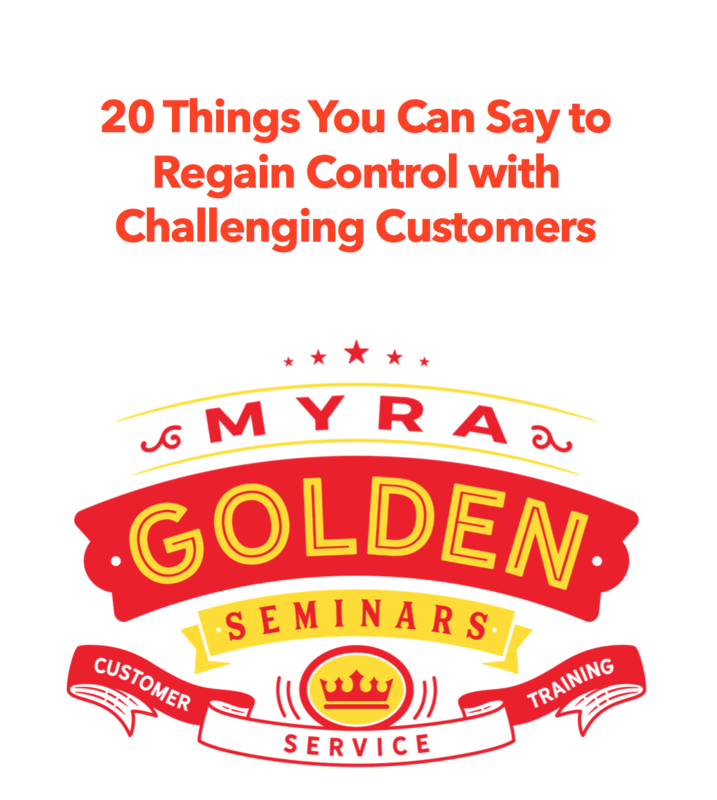 Sign up for my email list and learn specific tips, approaches, and phrases to help your employees help your customers. Previous Previous post: That Time My Client Cropped My Afro In My Headshot, And Why This Is Not Okay.